This acoustic album is heady, electric stuff, from one of the strongest, freshest new bands in New York. They are pianist Lucian Ban (originally from Bucharest, Romania), alto saxophonist Jorge Sylvester (originally from Panama) and a powerful rhythm force of bassist Brad Jones and drummer Derrek Phillips. 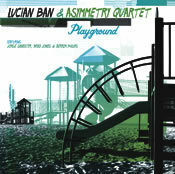 What makes Playground work is the juxtaposition of Ban’s Old World intellectual romanticism and Sylvester’s earthy Third World fervor. The opener, “Hieroglyphics,” is a veering, convoluted anthem with fierce drum breaks and skittering volleys from Sylvester over Jones’ broken ostinato. Ban’s solo slides off in spare, provocatively independent, paradoxical abstractions. Sylvester is an exciting player because he combines edgy ideas with a lush, rich alto sound. Ban writes subtle, intriguing tunes (eight of the nine here), and every one of his solos finds uncommon lyricism. The liberated latter-day ballads are best. “Gentle Shifts Rain” hovers in space, rather like Jimmy Rowles’ “The Peacocks.” “Silence” is for Shirley Horn, with Sylvester piping high and Ban picking out bare fragments. 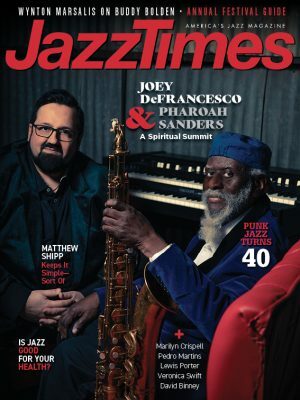 It is one of the most moving eulogies in recent jazz. The painfully slow near-stasis of a Shirley Horn ballad fully prepares for the entrance of Horn’s breathy human living voice, but in its place there is-silence.